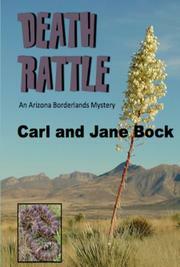 An Arizona murder mystery revolving around border tensions and rare snakes. The Bocks’ (Coronado’s Trail, 2016) latest novel again features Arizona sheriff Calvin Creede and his troupe of family, friends, and allies trying to uphold law in the little crossroads town of Sonoita. It begins ominously. Young slacker Andy Slawson, employed irregularly as an errand boy by local farmer and flying-saucer buff Moss Winslow, is down at the roadside box checking Winslow’s mail. When he opens the box and peers inside, he’s bitten on the face by a Mojave rattlesnake somebody stuffed into the mailbox (rattlers, we’re authoritatively informed, don’t climb). Creede and his partner, Santa Cruz County deputy sheriff Larry Hernandez, begin an investigation, aided by Creede’s girlfriend—and avid snake enthusiast—Maria Obregon. When young Andy dies without regaining consciousness, Creede feels increasingly certain he’s dealing with a homicide—and increasingly uncertain who the intended target really was. In economical, deftly handled sketches, the Bocks introduce their large cast, from universally beloved local matriarch “Aunt” Grace Slawson to crass Harlo Henshaw, leader of an informal local vigilante group calling itself the Border Posse, to shady land developer J.L. Minkston to eccentric, suspicious amateur herpetologist Ambrose Pendleton. They’re likewise adept at juggling the novel’s many running themes, from the hot-button issue of illegal immigration to the black-market trade in rare species of poisonous snakes. The affable, low-key Creede is an inviting reader stand-in, although at times he verges on blandness, and the Bocks have a tendency to telegraph plot developments (seasoned mystery buffs will have no trouble spotting the main villain in this outing), but the large, colorful supporting cast compensates, and the solid pacing maintains itself to a satisfying if surprisingly bittersweet payoff. Fans of Craig Johnson’s Longmire novels or CJ Box’s Joe Pickett adventures shouldn’t miss this series. A solid, involving entry in a Southwestern murder-mystery series of increasing promise.